This post is a continuation of my Atlantic City Sampling Experience via Crowdtap! 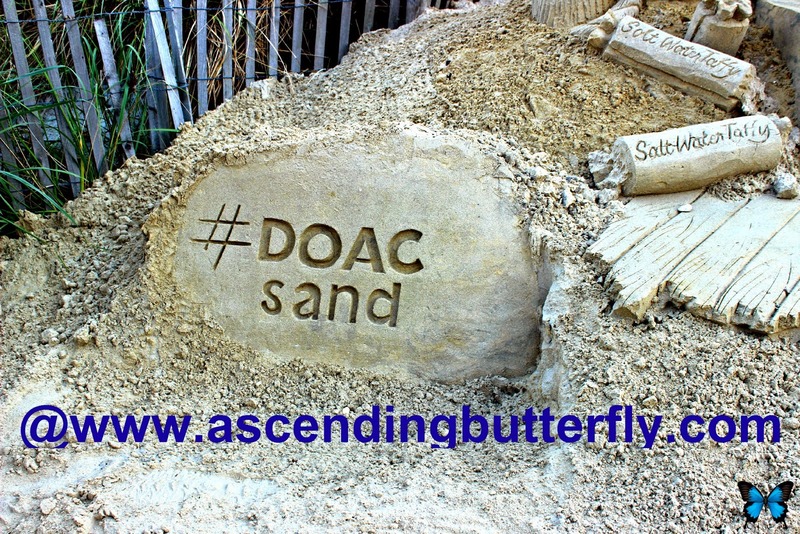 (Check out the first post HERE) I told you Atlantic City has a ton of things to see and do, it's just as family friendly as it is a place for singles like me, one of the activities on my itinerary was the DO AC Sand Sculpting World Cup in Atlantic City. I took so many hi-res photos I was afraid to break my server so I created a slideshow of the amazing sand sculptures, I even got to meet a few of the sculptors which was pretty neat! I used Flickr to create this slideshow, but if the slideshow moves too fast for your taste you can check out each photo individually in two places: Flickr - DO AC Sand Sculpting World Cup 2014 as well as on our Pinterest Travel Board (I may create a unique board for these on Pinterest in addition to throwing them into travel, once I do I will come back and update this post with the direct URL). Which is your Favorite Sand Sculpture in the Slideshow Butterfly? FTC Disclosure: I am disclosing this in accordance with the Federal Trade Commission 16 CFR, Part 255 - Guides Concerning the use of endorsements and testimonials in advertising, you may check our Giveaway and Disclosure Page for additional information regarding Ascending Butterfly Disclosure. I was selected for this opportunity as a member of Crowdtap and the content and opinions expressed here are all my own. This post is a continuation of the Atlantic City Sampling Experience offered to select Crowdtap members. Let the Games Begin is favorite! Amazing! In Wisconsin we have snow sculpting in the winter...I would love to see sand sculpting! I love sand sculpture competitions. They have one every summer on a beach near me and we love going to look at the sculptures. Whoa! that's just too neat. I love the mermaid sand sculptor . I bet that took hours upon hours to make. What do they do with it when it's over? Sand sculptures are so amazing. They do them up here in MI on the Great Lakes shorelines. In the winter we have ice sculptures. Its amazing how people come in from all over the US and Canada. This past years ice sculpture saw folks from Germany. Amazing what people can do with ice and sand. Tracy, these are simply unbelievably good! Another, 'how'd they do that' moment! Thanks you. Wow - those are amazing! I've never seen anything like these! I love the sand castle, but the Mr. Peanut one with CBS is pretty cool too! That would be fun to meet the sculptors, and I'd be taking a ton of pictures too. Sand sculpting is neat! Those are amazing! The mermaid is really cool! These are truly amazing ,I could spend half the day looking at these beautiful sand sculpture's. ( I can't pick one as my fav.) I love to go to AC your right their's is so much more to do and see .Still love to play the slots !! This is so much fun. I've never been to Atlantic City but it's on my lists of places to visit. So so much talent. I would love to be able to do this! My daughter loved the mermaid sand sculpture. They were all beautiful. Looks like fun! That is so amazing. I saw sand sculptures in Florida once and was amazed at the time and effort ! These are amazing! I can't believe the detail in the sculptures. I'm loving the music-themed one. Wow, this looks like so much fun. What awesome sand sculptures! I am really loving the mermaid sculptures, such amazing work! When I went to the beaches in NC, I saw these all of the time. Not sure why I do not see them at beaches in Florida. Sand sculptures are truly amazing. I love all the pictures you captured but love the mermaid ones the best. Sand sculpting is so awesome. I've tried my hand at a basic sand castle and it turned out like crap. I enjoy seeing the amazing work of others. They make it look so easy. I have never seen sand sculpting in real life just online. I think it would be pretty cool! I love looking at them in Ocean City, MD, too. I think the music one is my favorite, but they're all awesome!